Corrosion is an oxidation process that occurs in metal due to a chemical reaction caused by water and salts. The process is common across the United States; in the coastal states, salty moisture is pervasive throughout the air because of nearby seawater. In the Northeast and Midwest states that experience harsh winters, road chemicals such as brine, magnesium, and calcium chloride can wreak havoc on the metal surfaces of your tractor trailers. For metal surfaces, the effects of corrosion are similar to that of weed growth in grasslands. Once corrosion penetrates any point of a given surface, it degrades the quality of the metal and swiftly spreads to neighboring areas. In the most concentrated spots, corrosion gradually burns through the metal to form abrasions, cracks, and holes. When corrosion affects areas such as wheel ends, the effects are damaging to the quality and performance capabilities of the vehicle in question. If the problem is not rectified, wheel-end corrosion can put drivers and fellow motorists at risk. On wheel ends, corrosion is generally the result of salt and harsh road chemicals coming into contact with the surfaces of metal hubs and fasteners. In fall and winter months, water can make its way to these underside components via moisture, puddles, and precipitation. As inclement weather hits, the presence of rock salt and chloride on roadways is also damaging to truck and trailer metal surfaces. There are also dangers of fleets experiencing corrosion on the inside of their wheel-ends, due to the reaction of glycol-based products in contact with wheel-ends that experience high-heat environments, such as in public transit or waste haul applications. While this is not a reaction caused by road chemicals or salts, it’s important to understand how each wheel and tire solution used by fleets may affect the metal surfaces on their tractor trailers. One of the most common causes of corrosion on metal truck parts is moisture. The problem with moisture is most prevalent during colder months, when the moisture that would normally get vaporized into the warm air deposits onto cold surfaces, hence the buildup of condensation. Metal surfaces, which are prone to develop rust and corrosion through the absorption of water, are particularly vulnerable to condensation. On the mornings when the windows of your truck get fogged up with moisture, chances are the underside components are also moisture-laden, including the wheel-ends. Moisture can also appear in hot, enclosed environments. If you park your truck in a hot garage with poor ventilation, your wheel-ends could be vulnerable to corrosive moisture absorption. And specifically with Liquid Petroleum Haulers, accelerated corrosion can appear on vehicles due to the white foggy residue of the LP that can end up anywhere on the vehicle. When combined with a dewy morning, that foggy residue acts as a corrosion accelerant – lifting paint jobs and attacking metal parts. For the same reasons moisture is bad for metal truck parts, so too are bodies of water. When you drive your truck over puddles, water is liable to splash up and hit various underside components. Even though the water will mostly dry off and drip away, water can still get trapped in certain crevices. Wetness can have a corrosive effect on the parts that comprise your wheel-ends, especially if water makes its way between the fasteners. The problem is most common during fall and winter months, especially in regions that see heavy precipitation. In colder parts of the U.S., rock salt gets spread on roads to break up ice and allow for the passage of vehicles despite the presence of snow. While the solution does make roads safer for traffic, the effects of rock salt are damaging to metal surfaces. When contact occurs between rock salt and metals, the properties of the former have a corrosive impact on the latter. Even on aluminum parts, the corrosive effects of rock salt can eventually take hold. Salt has always been problematic for steel wheels, but the issue has been exacerbated over the past quarter-century as cities have switched to magnesium and calcium chlorides, which combat snow and ice but also hasten the corrosion of metal surfaces. According to a 2002 study of Colorado fleets by the American Trucking Association, 72 percent of the companies surveyed complained underside wear had become more pronounced since the Department of Transportation rubber-stamped magnesium chloride as an ice-clearing solution. In addition to its corrosive effects on wheel parts, magnesium has reportedly caused brakes with a 60,000-mile life expectancy to fail after 20,000 miles. Magnesium chloride is also a stubborn substance that refuses to melt or dry away in tight places. If the substance gets between tight metal joints, it will remain there unless you disassemble and clean the parts. Corrosion becomes evident as discoloration and deformation appear at given spots along a metal surface. The problem is more than a mere aesthetic issue, however, because corrosion in and of itself is symptomatic of a metal’s failure to retain its composition. Corrosion, in effect, amounts to poor metal health. As the condition lingers on a metal surface, corrosion spreads and affects adjoining surfaces. Along the moving parts of a truck, lubrication is the only thing that stands in the way of friction between metal surfaces. Without lubrication, the grinding of metals produces friction, heat, and ultimately corrosion. The wheel-ends of a truck are especially vulnerable to this process because the lubrication can easily get melted or washed away by puddles, moisture, heat, and magnesium chloride. The most dangerous effect of corrosion is the damage it does to metal. On the wheel-ends of a tractor trailer, such damage could lead to a breakdown of the wheels at any given time if you fail to discover and rectify the problem. The damage can quickly degrade any metal component that becomes heavily exposed to rainwater, moisture, or magnesium chloride. Whether the problem impacts one of the fasteners or the inner hub, corrosion can swiftly spread and lead to the formation of holes and cracks in vital wheel parts. The effects of corrosion on the underside components of a hauling truck can be slow or swift, depending on the extent of exposure. In cases that badly affect the wheels, the vehicle could become harder to steer and control as stiffness or shakiness takes hold. If the corrosion breaks down one or more of the metal parts, the vehicle could suddenly falter in transit. Drivers and fleet operators who fail to inspect their trucks and heed the warning signs are especially vulnerable to accidents of this nature. Spotting corrosion along the parts that comprise the wheel assemblies of a tractor trailer requires close inspections along the inner and outer hubs of each wheel. If corrosion is present, assess the damage done by the corrosion; if the steel wheels are still in sound structural condition, find a commercial tire dealer with a wheel refinishing system designed for commercial steel wheels. This service provider will understand the proper method of removing old coatings, inspecting the steel wheel for out-of-service conditions, using the right consumables specific for the commercial trucking application, and the proper post-cure checks to ensure that your fleet receives a safe, reliable refinished wheel. Regularly inspect the underside metal components of a truck for signs of corrosion. Depending on the conditions of your working environment, these inspections could range in frequency. If the weather is neutral and free of corrosive effects, check the wheel ends every six months. If the weather straddles hot/cold extremes in your area and inclement weather is a constant factor, inspect the wheel-ends monthly. If the roads on your route are currently covered with magnesium chloride, inspect the wheel-ends weekly for as long as the situation persists. Perform a quick once-over of the wheel-ends anytime a nearby component is getting serviced. The reddish/bronze color of rust is a familiar site, yet the appearance of corrosion is sometimes harder for the untrained eye to detect on a given metal. In some cases, corrosion does assume a rust-like color. However, corrosion is also known to take the same color as the underlying metal, if not darker. Physically, corrosion usually has a swollen texture that deviates from the general smoothness of a metal surface. As corrosion eats its way through a metal surface, the affected part is liable to crack or flake away in the most heavily concentrated spots. Therein lies the greatest possible danger for vehicles on which corrosion has gone undetected. Without periodic inspections, corrosion on the inner hub will often go undetected until the problem spirals out of hand. Thoroughly inspect the inner hub for signs of corrosion along tight, obscured areas, particularly around the fasteners. According to HDT, if corrosion is present along the inner hub, a mechanic will typically use a six-inch sander with 100-grit paper to wipe the corrosion away. If this does not work and the problem is too extensive, the inner hub will need replacing. Corrosion on the hub is easier for the naked eye to spot in passing. However, you should take a closer look at the hub of each wheel at least twice yearly for signs of formative corrosion. On hubs that do have mild issues, a mechanic will often employ a right-angle die grinder to clean the affected spots. To further clear away surface corrosion, the mechanic will then remove the drum with the aid of a lifting device and proceed to clean the mating surfaces. The fasteners of a wheel-end require special attention because of the tiny grooves and inner rings in which corrosion can evade the naked eye. If a wheel-end has corroded to any degree, a mechanic will often test the bolts with a slide-on socket tool. If a slide exceeds four threads, the bolt will have failed the test. If a bolt is acceptable, the threads then get wire-cleaned and lubricated with a single drop of 30-weight oil. This process improves the spinning ability of the threads and inhibits future rust formation. 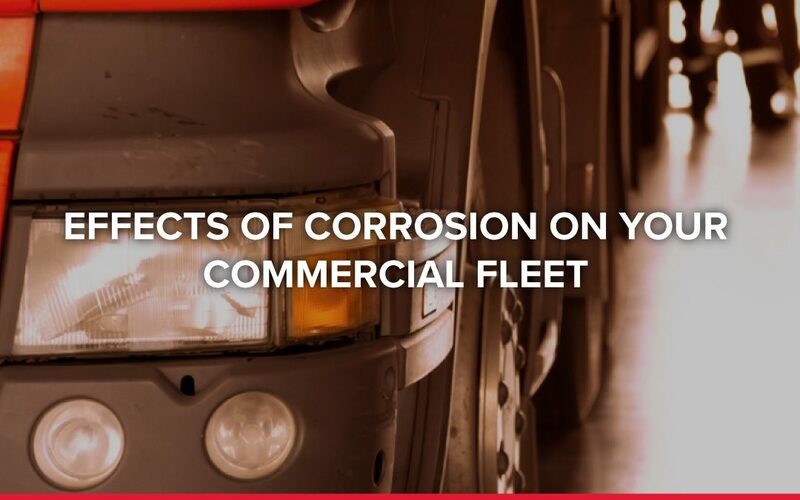 To inhibit and possibly prevent corrosion on the wheel ends of trucks and trailers, you must consider the exterior factors that could raise the vehicle’s exposure level to corrosive elements. With each inspection and visit to the service station, consider the benefits of different washing methods, surface treatments, and protective touches. HDT provides a detailed list of preventative measures, so we’ve gathered some of their tips below and added a few of our own as well. And when looking to prevent corrosion at the wheel-end, keep in mind the powder coating used on your wheels is your barrier against the harsh chemicals on the road. Each coating is designed for a specific purpose, and not all of those coatings are designed for what fleets encounter. The commercial trucking industry requires high-quality and durable coatings, specifically designed for harsh environments experienced by your fleet. The powder used in IMI’s MILCURE Wheel Refinishing system is engineered specifically for commercial steel wheel refinishing. In addition, to provide the best corrosion resistance, you should talk to your service provider about using a zinc-rich primer prior to powder coating; the primer will provide protection against inset corrosion that can’t be eliminated through any coating removal. Corrosion prevention begins with modifications to the environment in which you store your truck when it is not in use. If you operate in a typically hot environment, avoid leaving the truck parked in enclosed lots with poor ventilation, as the humid air could generate corrosive moisture. If you operate in a colder environment, be sure to inspect the wheel-ends weekly, especially during months when the windows require constant defogging. During heat waves or subzero temperatures, check the lubrication on your wheel parts and clean/reapply as necessary to ensure proper viscosity. To inhibit corrosion on vehicle underbodies that have been exposed to magnesium chloride on wintry roadways, some maintenance specialists apply power-washing methods. Along the more hard-to-reach spots of a wheel-end and its neighboring components, a power wash will employ pressure that can wash away the stubborn residue of harmful chlorides. However, experts remain divided on the use of this method due to the impact of the water itself, which can work its way into tight underside parts. Once trapped, the water can then enact its corrosive effects on the parts in question. Corrosion often spreads along underside fasters due to the water and chloride trapping that occurs in assorted sockets and threads. To ensure maximum corrosion resistance on wheel-end fasteners, more fleets are requesting stainless fasteners each time a truck gets taken in for service work. Stainless wheel-end fasteners, as well as stainless slack adjusters and brake chambers, are better equipped to withstand the effects of corrosive elements. This resilience, in turn, helps prevent the spread of rust and corrosion along adjoining parts. Mechanics sometimes apply corrosion inhibitors like asphalt and zinc to disassembled metal truck parts. Solutions made of these mineral types help ferrous metals resist the corrosive effects of chloride, water, and moisture. While not a permanent or foolproof solution, coatings of this sort can help trucks resist several seasons of inclement weather and salt-coated roadways. In earlier decades, mechanics used oil as a wheel-end lubricant. Among today’s fleets, high-viscosity grease is the preferred lubricant on the moving parts of a wheel assembly. Either way, it is crucial to check the lubricant periodically to ensure the viscosity remains optimal at all times. In hot environments, a lubricant can melt away and leave the metal vulnerable to friction. In freezing temperatures, a lubricant can become hard and lose its effectiveness. Either effect will quickly render the wheel ends vulnerable to friction, heat, corrosion, and damage. When it comes to the prevention of and protection against corrosion at the wheel-end, it’s far more cost-effective to have your steel wheels refinished at a trusted, trained service provider. By working with an IMI-trusted partner utilizing the MILCURE Wheel Refinishing System, fleets have managed to improve the quality and longevity of their wheels – directly affecting fleet productivity and ROI. Contact IMI today to learn more about corrosion protection at your wheel-end and find a MILCURE service provider in your area, or watch our webinar to learn more about the MILCURE Wheel Refinishing System.